Dr. Mead is the author of two books. Please see below for brief summaries. 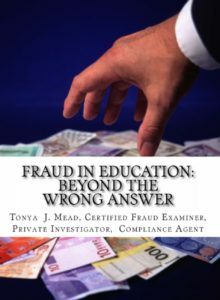 Consider reading the first definitive book on fraud, white collar, and data related crime in the education sector. An identification of the ‘red flags’ for crime, targeted organizational departments and functions, documents most likely tampered and data most often manipulated will be reviewed. Finally an extensive discussion and research-based best practiced are reviewed for supports and prevention. Extreme: Are you Woke Yet? In five short years (2024), experts predict that the average Black household wealth will decline by 30%. This is after the 50% drop in wealth from 2006 to 2011. The public educational system and politicians have failed us. We must act now before it is too late. If we are not careful, economists warn that Blacks will not hold any assets by 2053. This book is packed with 300 pages of faith-based strategies for Blacks to expand their financial horizons and to break the psychological chains that bind them to poverty, oppression and racism. The author calls upon readers to collectively awaken from our slumbers and rise on our wings before it is too late. During one-on-one, group sessions and presentations, Dr. Mead utilizes the concepts in her book, NPL and Hypnosis to share with her clients the practical application of positive thinking, guided imagery and regular citation of positive affirmations to break the pre- programmed mental chains of limit, lack and distress leading to self defeating attitudes, thoughts and behaviors.